The film opened with film footage of a recent crime scene -- a Channel 10 News crew (cameraman and reporter Bree (Laura De Cartaret)) was filming an officer reporting three dead at 628 Tremont, in Homestead, where an unidentified husband shot his wife and 16 year-old son and then blew his own brains out. The dead family was a suspected immigrant couple with no ID papers. In the news footage, as the corpses were wheeled out of the apartment building and into the back of an ambulance, suddenly, the body of the female woke up and began to move on the gurney, and she bit the neck of an medical services member providing aid. And then the son became reanimated as well and attacked another EMS crew member. Officers opened fire on the two zombies, and news-reporter Bree was bitten in the face before both could be stopped, by shooting them in the head. And then it became clear what was happening - she described a student film-making project and its relation to the late-breaking news over a three day period, and the young filmmakers' desire to tell the real truth of the zombie attacks with their own first-person footage. The students believed the government was lying about the causes of the zombie resurrection, and vowed to show the world the truth of what had really happened. The Death of Death began (a "film within a film"), after the previous prologue. October 24th, 11:00 pm - students were making a B-grade mummy horror movie ("with an underlying threat of social satire") in the woods on a three-day shooting schedule, in which a damsel in distress (student actress Tracy Thurman (Amy Lalonde)) was pursued by a Mummy (student actor Ridley Wilmot (Philip Riccio)) in one of the scenes. Aspiring director Jason Creed cut the action, to instruct his actors: "Dead things don't move fast. You're a corpse, for Christ's sakes." He also complained about the Mummy's unglued makeup, and he reprimanded the make-up artist Tony Ravello (Shawn Roberts). They were supervised by their Faculty Advisor, Professor Andrew Maxwell (Scott Wentworth) in their college film studies course, Jason's senior-class project at the University of Pittsburgh. As they argued with each other, another student named Eliot Stone (Joe Dinicol) announced hearing a radio report about "something weird going on." On the radio, they heard that "two news agencies in two separate counties in the Tri-State area are reporting accounts of the dead returning to life." There were six separate, inexplicable cases of the dead awakening, including a 50 year-old white male, the victim of a drive-by shooting, who sat up on an autopsy table and attacked a medical examiner, and in another instance, a corpse that apparently revived itself at a hospital. The faculty advisor stressed that they should believe the report: "The problem doesn't seem to be that people are waking up dead, but that dead people are waking up." Ridley was fearful of the report and decided to leave the film project to return to his well-fortified home in Philadelphia, joined by blonde Francine Shane (Megan Park). Filming was shut down, and Jason decided to head to the Univ. of Pitt dormitory of his girlfriend Debra Moynahan, where he arrived 25 minutes later and found it seemingly deserted. Still filming - with his POV through the camera, he found Debra in her room. She hadn't been able to contact her family at her house for hours. On her dorm computer screen was the news report that had played at the start of the film. Jason, always behind the camera and filming, recorded their journey with student Mary Dexter (Tatiana Maslany) driving a run-down Winnebago to Debra's home in Scranton, Pennsylvania. The official television news version of the zombie attacks was that they were only isolated, unrelated incidents and terrorism was not involved. It was speculated that a virus strain may have caused a "mass psychosis." Jason forced each individual in the RV to introduce themselves to the camera as part of the historical, documented record of events: first Debra, then Rony, Mary, Eliot, Gordo Thorson (Chris Violetti) and his pretty blonde Texan girlfriend Tracy Thurman, and finally flask-drinking Professor Andrew Maxwell. As the group made a getaway to return to eastern Pennsylvania, they came across a fiery road accident blocking the rural highway. It had a grisly, frightening aftermath when they noticed a badly-burned/fried State Trooper from the crash stumbling towards them from the wreckage. They feared: "He can't be anything else but dead" - therefore, a zombie. When the officer approached closer to their vehicle, Mary ran him over and then plowed into three other zombies, as she drove off from the horrifying scene (captured on Tracy's camera). When they pulled over at about 3 am by the side of the road in the middle of nowhere, Mary was sobbing and depressed over the murders she had caused, although Debra attempted to comfort her: "They were already dead." About an hour later, Mary suicidally shot herself in the head with a gun, and when the panicked group realized she still had a pulse, rushed her to nearby Parkdale Hospital where everyone apparently had abandoned it in a hurry. They split up and looked through the empty hallways for a doctor - Gordo found a nurse's station with a radio station broadcasting gunshots and "complete f--king chaos." Amidst screams, a man was heard saying: "Tell everyone out there you gotta get them in the head." Jason rhetorically asked: "What if it is for real?" Behind a privacy curtain, some of the group members saw a moving figure and asked for help, and found it was a zombie surgeon eating the flesh of a hospital patient - he could only be stopped by Gordo shooting him in the head. Another zombified nurse also threatened them - Debra shocked both sides of her head with a defibrillator (causing her eyes to explode), before Gordo unjammed his gun and also shot her in the head. Jason complained about running out of battery power for his video camera, so he remained with an unconscious Mary in a wheelchair while he plugged in and charged his camera, as the others searched elsewhere: "I can't leave without the camera. The camera's the whole thing." Soon after, Jason heard screams from Debra and gunshots, and called out: "What's happening?" but wouldn't unplug to go help. Bloodied, Debra returned with another video camera she had found in one of the rooms, turned the camera on Jason, and reprimanded him for his obsession about his camera and documentation of events: "See how it feels to have a camera shoved in your face. To have to answer stupid questions when people are dying all around you? You see how it feels?" When he asked what had happened, she answered pointedly: "Well, you missed it. If it didn't happen on camera, it's like it didn't happen, right?" Overburdened by his capacity to easily kill, Gordo realized that he had already killed three men and a woman in the hospital in the last half hour. This reminded the Professor that "in wartime, killing comes easily" to soldiers, but not to those like Jason who are "wanting to document, wanting to record some sort of diary...This is a diary of cruelty." At that moment, Mary wheezed and groaned - apparently dead and reanimated, and the Professor took Gordo's gun and killed her. As they walked through the corridor to leave the hospital, a zombie patient with an IV drip on a stand bit Gordo in the arm. Enraged, Eliot grabbed the IV pole and stabbed him four times in the body to show how the patient was really "dead" - but still alive as a zombie, and then finished the ghoul off with a jab to the forehead. Debra gave up her video camera to the Professor, claiming: "It's too easy to use," and then bitterly told Jason: "I don't want to become you." She also spoke, in voice-over, about the ubiquitous nature of video cameras, people's compulsion to use them, and the obsession to watch: "Compelled, like the man said, Jason was compelled. I had never seen him like that before. What is it? What gets into our heads when we see something horrible? A horrible accident on the highway. Something keeps us from just driving on. Something holds us. But we don't stop to help. We stop to look." October 25th, 7:00 am - Mary was buried with her St. Christopher medal, and Gordo died from the arm bite. Tracy waited until she was certain that he was reanimating rather than having Tony instantly shoot him ("Maybe it won't happen to him"), and then shot him herself when he awakened as a zombie. The latest television news broadcasts spoke of violence in cities, including looting and killing, and smaller towns had become deserted ghost towns. The newscaster speculated that people fled because "this might be the beginning of some sort of Armageddon." Back on the road, their RV broke down in a rural area due to a leak in the fuel line, and Tracy proposed to fix it. A deaf Amish farmer named Samuel (R.D. Reid) who could read lips appeared - along with more zombies. From his barn, the farmer hurled a stick of dynamite at three undead to obliterate them. As they fixed the RV inside Samuel's barn, more attacking zombies surrounded the wooden structure. When they were driving out of the barn, Samuel was grabbed and bitten in the neck - he suicidally stabbed himself in the head with a curved scythe blade, killing the zombie holding onto him from behind. A radio report said that in three days, the slaughter death rate would quadruple, and in ten days would rise by 100%. Debra observed, in voice-over, that there were so many zombies, "there weren't enough bullets to stop them all." October 25th, 11:10 am - while searching for gas in a city, they were confronted by a heavily-armed gang of black men - rugged survivors who had stockpiled supplies in a fortified warehouse. They drove their RV into the building, where the leader asked Jason about his filming of "home movies" and commented: "Who's gonna be left to watch?" The group of students bartered for some of the gas that the survivors had siphoned from tanks in town. The leader, a member of the National Guard, described how they had the "power" because everybody else ("folks without suntans") had left, and he had little faith in the military. He refused to call what he was doing looting: "It's called doing what you gotta do." As they watched the footage from the original crime in Homestead, Debra realized, in voice-over, that the footage had been altered: "The media were lying to us, or the government was lying to them. They were trying to make it seem like everything was gonna be all right...Now I can understand why Jason was so anxious to upload his own footage. At the time, I didn't get it." With access to the Internet in the warehouse, Jason edited his footage and uploaded it to Myspace.com, and within eight minutes received 72,000 hits from all over the world, supportive that he was showing the world the truth: "They're not getting the truth from anybody else. All that s--t on the news is a pack of lies." He truly felt people would learn from how they had managed to survive. Again, Debra sarcastically reiterated to Jason that everything needed to be videotaped to become reality: "If it's not on camera, it's like it never happened, right? ", and she was taped arguing with Jason about her priority to return home. Debra received a cell-phone text message from her little brother, telling her that her family had been camping for four days in West Virginia, and were still alive and driving home. And Jason received a web-cam phone call on his computer from Francine and Ridley, telling them they were safe and inviting everyone from the RV to his Philadelphia mansion. Just before packing and leaving the warehouse, the National Guard leader worriedly announced that one of their members named Troy had a bad heart, died from a heart attack, and then had disappeared. Jason found himself lost in the warehouse, and was retrieved by Tony, while the National Guard group pursued the suspected zombie, but accidentally shot the wrong man. They finally located Troy in the fuel supply area, where Tony smashed a bottle of Hydro-chloric acid over the zombie's head, and his skull and brain slowly disintegrated before their eyes. Finally, the group borrowed enough fuel for their drive, and Debra was able to successfully demand food and supplies, and they departed for her house in Scranton 65 miles away. As they drove, Tracy received a video feed on her cell phone - it was from a message board on YouTube, from a survivor in Tokyo who said: "Very bad here" - it was one of many very similar posts from all over the world. Static broke up the broadcast when the phone service from relay towers ended, as the female urged: "Don't bury dead. First shoot in head." October 25th, 4:15 pm - they pulled into Debra's driveway and it looked like her family hadn't returned yet. While turning off the alarm system, they found her parents' car in the garage with camping gear, with the passenger door and window smashed and slightly bloody. During a search of the house, (footage that Debra initially considered leaving out of the final edit of the film), Debra's undead brother Billy jumped on her back - and was killed when Professor Maxwell, skilled in archery, used a bow and arrow to shoot him in the head. And Debra's zombified undead mother was discovered behind the living room couch chomping on the fleshly remains of her father's hand - she was also killed by the professor. They left immediately, driving to Ridley's mansion in Philadelphia. Along the way, members of the National Guard in jeeps stopped their vehicle, and while Jason's camera was forcibly turned off, the soldiers robbed the RV of its supplies and food, leaving them with only their weapons. [This short segment became part of the main storyline for the next film in the series, Survival of the Dead (2009).] Debra reminded them of everyone's fate: "'The world being what it is.' Think about that. From now on, everyone who dies is gonna come back...and try to kill somebody else. And on and on and on. Forever." A video feed from the Internet showed an armed zombie search-and-destroy group confronting an elderly couple in an apartment building, asking: "What are you hiding in there, old man?" One of the men was attacked by one of three zombie family members, and the enraged squad thought of killing the couple for lying to them. The injured squad member decided to shoot the couple himself - through their hearts: "Let him f--king wake up dead!" and then blew his own head off. Debra mused: "It was us against them. Except they are us." The RV arrived at Ridley's huge mansion, where they found the front door unlocked and open, and heard the sound of piano music. After a search, the house seemed abandoned, although video surveillance cameras were active. In the library, Professor Maxwell marveled at "absolute treasures" including a first edition copy of A Tale of Two Cities, when Ridley (still in his Mummy costume and acting weirdly) burst through a bookcase from a hidden Panic Room, equipped with a one-foot thick steel-reinforced door and multiple video camera monitors showing all angles of the isolated property. While Jason and Tracy unloaded the RV outside, Ridley took others on a tour of the luxurious home, with six bathrooms, a bar and gourmet kitchen. When Debra and Tony asked about Francine, Ridley claimed she was "out back with my family and the staff." He then elaborated and explained that they were all dead and he had to bury them - his father was the first one to die, followed by his mother and the three servants, and Francine was bitten on her face by the butler Brannigan. At the outdoor swimming pool, he showed where he had dumped the six bodies in the pool rather than burying them ("human goldfish in the f--king pool"). As Ridley left, he locked them in the pool area, but not before Tony noticed blood on Ridley's hand - probably from a bite. Ridley re-entered the house and became zombified, and then pursued Tracy (who was unloading the RV) and Jason (who was filming her). She ran when attacked and was pursued into the woods, scolding Jason for continuing to film her jeopardized plight ("A little help here?") - he jokingly responded: "See, I told you dead things move slow." She angrily screamed at him about how this was similar to the scene in Jason's student film project, with Ridley dressed as a mummy: "Just like your goddamn mummy movie!" when her costume's bodice was ripped off - but she was able to knock Ridley out when Jason distracted him. She returned to the RV and drove away without Jason. Ridley revived and returned to the house, where he confronted Eliot in the bathroom (unable to hear his approach due to the loud whirring of the hair dryer). Eliot was ambushed and died in the bathtub from electrocution (witnessed by the Professor over a video monitor within the Panic Room). The remaining survivors in the group (Debra, Tony, the Professor) prepared to keep safe in the Panic Room, although Jason refused to shut or lock himself off from the world in there, claiming they had weapons to defend themselves out in the open: "I'll miss everything" - he worried that his filming would cease, and vowed that he would rather risk continuing filming than be safe: "Who the f--k wants to survive in a world like this? All that's left is to record what's happening for whoever remains when it's over." After Jason lied about joining Debra in the Panic Room to appease her, he left them for a moment and was attacked and bitten by Ridley. The Professor used a large swashbuckling sword to split Ridley's head in two, and Debra obliged Jason (ironically, his last words were "Shoot me") - by shooting him dead. Afterwards, she watched video footage that Jason shot of himself - literally his last message before he died, about his desire to do his best in documenting "the truth" with his friends. He vowed "no fakeness" - he would "go after everything" in his "really raw" film, and he expressed his excitement about being given this opportunity. Debra promised to continue filming: "I'm gonna finish his movie." She knew that "there's gonna be more, there's gotta be more." October 26th, 6:24 am - the next morning inside the Panic Room, they watched as the undead approached the mansion to break in. The zombies from the pool area and Eliot joined them, prompting the Professor to shut the Panic Room door to seal themselves inside. The film concluded with footage of two inhumane redneck members of a zombie hunting party that was sadistically using three zombies tied to trees as target practice. 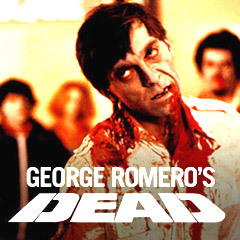 The fifth, low-budget film was considered a modern-day, rebooted or updated, 21st century reimagining of the first Romero film. It postulated that political/social unrest - and the zombie infestation - was now a worldwide phenomenon. Romero designed it for the passive, detached YouTube and myspace.com media-saturated generations. The entire movie was a "film-within-a-film" titled The Death of Death, shot by film students after they discovered a real zombie uprising. Composed of first-person video footage (from security surveillance cameras, news footage, digital camcorders, YouTube, cell-phone cameras, etc. ), it was edited together by Debra Moynahan (Michelle Morgan), the girlfriend of a posthumously-dead film-making boyfriend Jason Creed (Josh Close) - and then uploaded to the Web with 'scary music' added. The students believed the government was lying about the causes of the zombie resurrection, and vowed to show the world the truth of what had really happened. With a production budget of $10 million, and grossed only $1 million (domestic) and almost $5 million (worldwide). With the tagline: "Shoot the Dead."